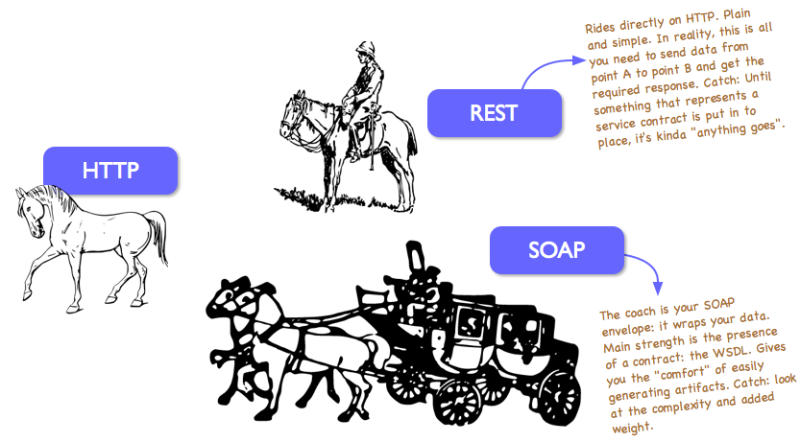 For now I have a slight idea about the differences between SOAP and RESTful Services. My question is when I should use SOAP, and when I should use RESTful; which one is "better" when it comes to performance/speed or request handling? I'm implementing for the first time in RESTful(java) and I want know more about it; I've dealt with SOAP before. REST is almost always going to be faster. The main advantage of SOAP is that it provides a mechanism for services to describe themselves to clients, and to advertise their existence. REST is much more lightweight and can be implemented using almost any tool, leading to lower bandwidth and shorter learning curve. However, the clients have to know what to send and what to expect. In general, When you're publishing an API to the outside world that is either complex or likely to change, SOAP will be more useful. Other than that, REST is usually the better option. I am seeing a lot of new web services are implemented using a REST style architecture these days rather than a SOAP one. Lets step back a second and explain what REST is. The acronym REST stands for Representational State Transfer, this basically means that each unique URL is a representation of some object. You can get the contents of that object using an HTTP GET, to delete it, you then might use a POST, PUT, or DELETE to modify the object (in practice most of the services use a POST for this). All of Yahoo's web services use REST, including Flickr, del.icio.us API uses it, pubsub, bloglines, technorati, and both eBay, and Amazon have web services for both REST and SOAP. Google seams to be consistent in implementing their web services to use SOAP, with the exception of Blogger, which uses XML-RPC. You will find SOAP web services in lots of enterprise software as well. Easy to consume - sometimes Rigid - type checking, adheres to a contract Development tools For consuming web services, its sometimes a toss up between which is easier. For instance Google's AdWords web service is really hard to consume (in CF anyways), it uses SOAP headers, and a number of other things that make it kind of difficult. On the converse, Amazon's REST web service can sometimes be tricky to parse because it can be highly nested, and the result schema can vary quite a bit based on what you search for. Which ever architecture you choose make sure its easy for developers to access it, and well documented. REST is an architecture. REST will give human-readable results. REST is stateless. REST services are easily cacheable. SOAP is a protocol. It can run on top of JMS, FTP, Http. REST has no WSDL[Web Description Language] interface definition. REST is over HTTP, but SOAP can be over any transport protocols such as HTTP, FTP, SMTP, JMS etc. ► SOAP is simple object access protocol that run on TCP/UDP/SMTP. ► SOAP read and write request response messages in XML format. ► SOAP uses interface in order to define the services. ► SOAP is more secure as it has its own security and well defined standards. ► SOAP follows RPC and Document style to define web services. ► SOAP uses SOAP-UI as client tools for testing. ► REST is representational state transfer that uses underlying HTTP protocols. ► REST is an architectural style that is used to describe and define web services. ► REST can read and write request response messages in JSON/XML/Plain HTML. ► REST uses URI for each resource that is used in web service.A resource can be image text method etc. ► REST uses set of VERBs like HTTP's GET, POST, PUT, DELETE. ► REST is easy to develop and easy to manage as compared to SOAP UI. ► REST has light weight client tools or plugins that can easily be integrated inside browser. ► REST services are cache able. REST stands for Representational State Transfer where as SOAP stands for Simple Object Access Protocol. SOAP defines its own security where as REST inherits security from underlying transport. SOAP doesnot support error handling but REST has built-in error handling. REST is useful over any protocol which provide a URI. Ignore point 5 for REST as mentioned below in the picture. If your application needs a guaranteed level of reliability and security then SOAP offers additional standards to ensure this type of operation. If both sides (service provider and service consumer) have to agree on the exchange format then SOAP gives the rigid specifications for this type of interaction. Totally stateless operations: for stateless CRUD (Create, Read, Update, and Delete) operations. Caching situations: If the information needs to be cached. SOAP web service always make a POST operation whereas using REST you can choose specific http methods like GET,POST,PUT,DELETE. Example: to get an item using SOAP you should create a request xml but in the case of REST you can just specify the item id in the url itself. Not the answer you're looking for? Browse other questions tagged java soap rest or ask your own question. SOAP or REST for Web Services? Why would one use REST instead of SOAP based services? I need to learn Web Services in Java. What are the different types in it? Why isn't SOAP-based web service RESTful? Compare and contrast REST and SOAP web services? Is RESTful faster than SOAP? and when to use one of them? Guide to choosing between REST vs SOAP services? where to start java web services? Should a Netflix or Twitter-style web service use REST or SOAP?